Most four wheel drivers understand the importance of running the correct Tire pressures for different situations and or load variances. This is why it’s so important to carry an accurate air pressure gauge and Tire inflation equipment in your vehicle, especially when driving off-road. 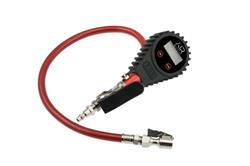 The ARB digital Tire inflator makes checking and adjusting your vehicle’s Tire pressures a fast and simple operation thanks to its large easy to read digital blue backlight display, big thumb operated inflator button and easy access deflator bleed button.